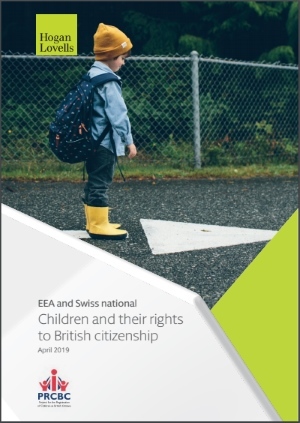 The Project for the Registration of Children as British Citizens (PRCBC) has updated its information leaflet about EEA and Swiss national children and their rights to British citizenship. You can download the 16-page information leaflet here. While the date of Brexit has been further delayed following yesterday's European Council meeting, the UK currently remains set to leave the EU and it remains likely that leaving will see the end of freedom of movement. PRCBC says it is vital that people born to EEA and Swiss nationals in the UK, and children brought to the UK by EEA and Swiss nationals, understand and are able to secure their rights to British citizenship. The leaflet gives a broad and easy to follow outline of British citizenship law and how it applies to the children of EEA and Swiss nationals in the UK. It sets out the scenarios in which a child born in the UK can become a British citizen, and includes a handy flow diagram summarising the routes to citiizenship. Meanwhile, Wesley Gryk Solicitors posted a brief update yesterday after its lawyers spent four days providing free immigration advice to EU citizens as part of the as part of the Mayor of London's #Londonisopen campaign. "The four days provided a valuable snapshot of how the public have understood the EU Settlement Scheme and laid bare the sheer scale of the challenge facing the Home Office. What was clear was that there was a significant amount of confusion about the scheme: how people make an application, what they need to apply, and when they need to apply by," Wesly Gryk's Isaac Abraham said. According to Wesley Gryk, the three most common topics that came up were residence in the UK requirements, closing dates for applying, and the method of applying for settled status. The Home Office announced yesterday that 57 organisations across the UK will receive funding to provide practical support to vulnerable or at-risk people applying to the EU Settlement Scheme. £9 million in funding will be provided to enable the organisations to both inform vulnerable individuals about the need to apply for settled status and support them to complete their applications. Home Secretary Sajid Javid was quoted as saying: "It's vital no one is left behind and we support vulnerable people who may have difficulties applying. This £9million of funding will help do that." The Home Office said yesterday that it had so far received over 400,000 applications to the EU Settlement Scheme.